The higher the rank of the Noble, the more Country cards are required. But, Nobles can be vanquished through the play of Intrigue cards! The game is played over three Periods, and victory points are awarded to the players with the most influence in each of the four Countries at the end of each Period. After the third Period ends, bonus points are awarded for the Titles, and the player with the most points wins! Each player chooses a player color and takes all the matching wooden nobles to form their "supply". Note: In a two-player game, the players must choose red and blue, since more pieces are needed. With more than two players, any colors can be used. Place the game board in the middle of the table. The oldest player will be the starting player. Note: It is important to recall who the starting player is. Place the hexagonal City bonus markers on the spaces next to the cities. Place the shield-shaped Country bonus markers on the spaces to the left and right of each matching country's coat of arms. Place the round Noble House bonus markers on the spaces along the left edge of the game board. Important: In a two-player game, use only the marker showing 8 victory points. In a three-player game, use only the markers showing 8 and 12 victory points. The other markers are not used and should be returned to the box. Place the square Period scoring markers on the matching spaces in the bottom right of the game board. These markers are divided into three groups for the three Periods (1648, 1680, and 1714). Remove the following Country cards from the game, depending on the number of players, and put them back in the box. Note that for 5 players, no cards are removed. Shuffle the rest of the Country cards and make a face-down draw pile next to the game board. Turn over the top three cards and place them face-up in a row next to the draw pile. Shuffle the Intrigue cards and make a separate face-down draw pile next to the game board. Then the player to your left takes a turn. Players continue taking turns until the Country Card draw pile runs out of cards. Draw 1 Country card and 1 Intrigue card (you can draw them in either order). When you draw Country cards, you may draw face-down cards from the draw pile and/or face-up cards from the display in any order you choose. But, the face-up cards are not refilled until the end of your turn. Intrigue cards are always drawn from the face-down Intrigue draw pile. If the Country Card draw pile runs out, the current Period will end at the end of your turn. If the Intrigue draw pile runs out, shuffle the discarded Intrigue cards and create a new draw pile. At the end of your turn, you may hold a maximum of 12 Country cards and 4 Intrigue cards in your hand. You are allowed to exceed this limit during your turn. At the end of your turn, you must discard any excess cards of your choice. Place them into their appropriate discard piles (Country or Intrigue). You may play any number of cards from your hand in any order you choose. You may play Country cards to place a wooden noble on a vacant Noble portrait in any city, thus claiming ownership of that Noble. There are one or two Nobles available in each City. Each Noble has a portrait. The number to the left of the portrait indicates the number of Country cards of that country which you must play in order to claim that Noble. The number is always the same for Nobles with the same Title. For example, all Countess Nobles require 3 Country Cards. 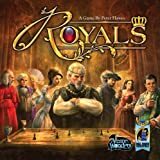 When you claim a Noble, place one of your wooden nobles on that Noble's portrait on the game board. 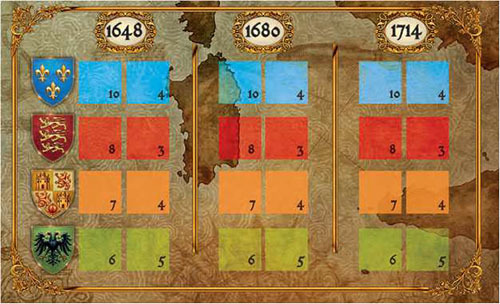 Place a second wooden noble on the matching Title scoring marker beside the game board. Important: There can never be more than one wooden noble on each Noble portrait, but there is no limit to the number of wooden nobles that can be placed on each Title scoring marker. The scroll to the right of the portrait shows the number of influence points in that Country that you gain as long as you control that Noble. Influence points are used to earn bonuses at the end of each Period. The Country cards you play go into the Country Card discard pile. Example: Ferdinand decides to claim a Noble in the City of Dijon. He plays 2 France Country cards, and places 1 of his nobles on the portrait of the Baron. He also places 1 noble on the Baron Title scoring marker. Now he will have 1 Influence point towards the control of France at the end of the current Period (assuming he can keep hold of his new Noble!). If you do not have the required number of matching Country cards, you may play any three Country cards as one Country card of your choice. You can take over a Noble that is already claimed by another player. Play an Intrigue card for that Noble's country. Play the required number of Country cards to claim that Noble. If you cannot play all of the cards required (Intrigue and Country), then you may not take this action. Important: You cannot take over a Noble that is already claimed by yourself! 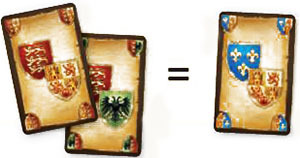 Each Intrigue card shows the coat of arms of two Countries. You may play the card for either of the two Countries shown. Note: Played Intrigue cards are always discarded to the Intrigue card discard pile, which is separate from the Country card discard pile. When the Intrigue card draw pile is exhausted, shuffle the Intrigue card discard pile to form a new draw pile. Here is how to handle the takeover: The original wooden noble on the Noble portrait is vanquished (that Noble has been assassinated or removed from power), and is placed on the Cathedral on the right side of that city. The vanquished wooden noble has been put to rest at the Cathedral and is "buried"! There is no limit to the number of vanquished wooden nobles that can occupy the Cathedral. Do not remove the wooden noble from the matching Title scoring marker - these nobles remain in place until the end of the game. Wooden nobles on a Cathedral no longer give influence points. They are still counted when determining the Country bonuses, however. You must now occupy the vacant Noble, by placing a wooden noble of your color on the portrait, as described under "Claiming a Vacant Noble" above. Place a second wooden noble on the matching Title scoring marker. Example: Louis wants to take over the Baron in the City of Dijon. 1 He plays one Intrigue card showing the coats of arms of France and Spain and two France Country cards. 2 Ferdinand must move his wooden noble from the Baron to the Cathedral in Dijon. 3 Louis then places one of his wooden nobles on the portrait of the Baron, and puts a second wooden noble on the Baron Title marker. If you do not have the correct kind of Intrigue card, you may play any two Intrigue cards as one Intrigue card of your choice. Because of their great power, Kings are more resistant to intrigue. You must play two Intrigue cards with the matching coat of arms of that country to take over a King. The wild card rule applies here. Once you are done playing any cards you choose to play, your turn is over. You must now discard any excess cards above your hand limit (12 Country cards and 4 Intrigue cards). Remember that all discarded or played cards go to their appropriate (Country or Intrigue) discard piles. If you drew any cards from the row of face-up Country cards, you must refill the row to three cards by turning over new cards from the draw deck. Now the player to your left begins their turn. If you fulfill the requirements to earn a Bonus, you immediately take the applicable marker (and the victory points shown) and place it face down in front of you. Keep your Bonuses in front of you until the end of the game. The first player to claim a Noble in a City takes that City's bonus marker. If you have at least one wooden noble in every City of a Country, you take the highest Country bonus marker available for that Country. If there are no more Country bonus markers available for that Country when you fulfill this requirement, you receive no bonus. Note: Vanquished wooden nobles on Cathedrals do count towards the Country bonus. You can only gain one Country bonus marker per Country. If you have at least one wooden noble on every Title scoring marker, you take the highest available Noble House bonus marker still available. If there are no more Noble House bonus markers available when you fulfill this requirement, you receive no bonus. You may only gain one Noble House bonus marker. The game has 3 "Periods". At the end of each Period, victory points are awarded to the two most influential players in each of the four Countries. A Period ends when the face-down Country card draw pile runs out. This can happen during the Draw Cards action, when you draw the last face-down card, or at the end of your turn, when you are replenishing the row of face-up Country cards and the draw pile is exhausted. When this happens, re-shuffle the discarded Country cards and create a new draw pile. Then, continue your turn as normal. The current Period ends at the end of your current turn. The game is briefly interrupted while the Period Scoring is handled. Then, the game continues with the next player's turn. Important: For the Third Period (only), continue taking turns until the current round is complete (i.e., the player to the right of the original starting player finishes their turn), so that all players have an equal number of turns in the game. Remember that the starting player is always the oldest player. Then resolve the scoring for the third Period. 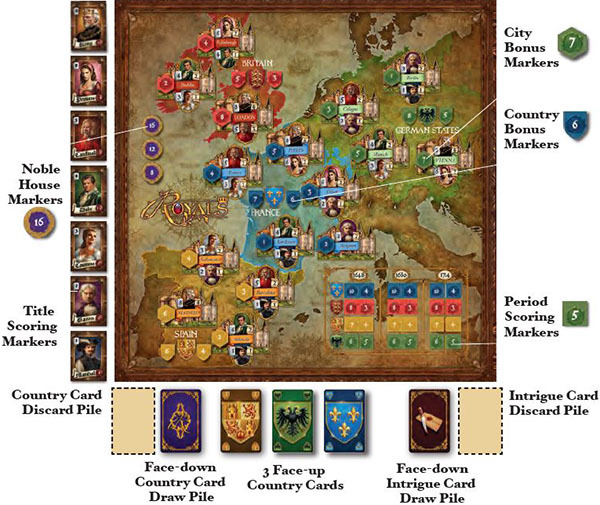 For example, in a 4 player game, with the players numbered 1-4 in the order they started playing; If the country cards run out during player 2's turn, they will shuffle the deck and finish their turn, and then players 3 and 4 will also finish their turn. Then, after player 4 has gone, the third Period scoring occurs. One Country at a time, all players add up their Influence points from the Nobles they have in that Country. Only count active Nobles (count wooden nobles on Noble portraits - do not count wooden nobles on Cathedrals). The player with the most Influence points takes the higher Period scoring marker for that Country for the current Period. The player with the second most Influence points takes the lower Period scoring marker. 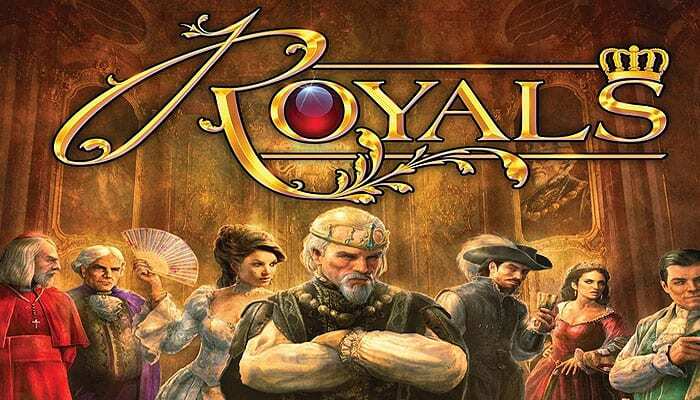 If there is a tie, the marker goes to the tied player who has the Noble with the highest Title in that Country The highest Title is determined by the number of Country cards required to claim that Noble (for example, a Princess (6 cards) is higher than a Duke (4 cards). In the rare case that this is also a tie, the marker goes to the tied player whose Noble occupies the City with the higher City bonus. Important: If only one player has Influence points in a Country, the lower Period scoring marker for that Country is not awarded and is removed from the game. The game ends after scoring the third Period. At this point, the Title markers are scored. Beginning with the lowest-ranking Title, the players compare the number of wooden nobles they have on each Title scoring marker. The player who has the most nobles on that marker takes the complete portrait, worth the full number of victory points shown on the front of the marker. If exactly two players are tied for the most nobles, both players take one half of the marker, turning it over to show the smaller portrait, worth the number of victory points shown on the back of the marker (half of the full value). 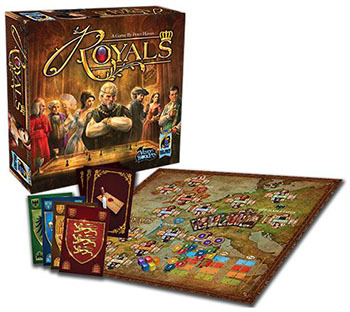 If more than two players are tied for the most nobles, the marker is not awarded and is removed from the game. All players now add up the victory points on all of their markers. In case of a tie, the tied player with the single highest valued marker wins. If they are still tied, compare the tied players' second highest valued marker and so on, until there is a clear winner. To make the game a little easier to play, with more choice and less luck, try playing with 4 face-up Country cards (instead of 3).